First of all, some background on myself and CMON. I am no financial expert, just a CMON fanboy who looked up some stock information. Secondly, I'm not defending the company, more of the opposite, I'm pointing out areas where the company could have done better. Next, the "$4.1 million revenue loss" is a VERY misleading term. CMON didn't lose any money technically – they just didn't earn as much this year compared to last year. The company has still brought in $11.8 MILLION this year, and that's only for 9 of 12 months, with these last 3 months typically (for the industry, not necessarily CMON) being the biggest months of the year. In the quarterly report, CMON attributes the lack of revenue to a decrease in kickstarter funds, so I thought I'd look up what they "made" (I.e. what the individual kickstarters raised, so these numbers don't actually translate to the amount of money that CMON actually received). NOTE: Project: ELITE just finished up recently but I doubt it was included in the quarterly report as I'm pretty sure they haven't gotten the money yet from Kickstarter. So I'm including those numbers for reference, but they aren't included in the totals. Ok, those are some fun figures, but what about the previous year? How did that go? Holy crap, that's a big difference. Actually, $3.6 million of a difference - not that far off from the $4.1 million quoted before (Yeah I know, that's before Kickstarter takes their cut). Now, many will look at that list and say "See! They had fewer, but better games last year! ", and yeah, you'd be correct. Then again, when talking quality over quantity, we are comparing 4 kickstarters to 5 (again, not counting Project: ELITE). But look at Cthulhu: Death May Die – this is a Cthulhu game from ERIC FREAKING LANG and ROB FREAKING DAVIAU that only brought in $2.4 million with 15,831 backers? Rising Sun got almost TWICE that much in funding/backers. It's hard to consider a kickstarter that made millions a failure, but to me that's pretty bad. Arcadia Quest: Riders – This is the only CMON kickstarter I backed this year (so far). Probably the biggest reason why is that I was able to jump in on the first wave and get my stuff before Gen Con. Also, this was post-CMON Expo and I was kind of on an Arcadia Quest wave. But this was basically a preorder for a couple extra minis to the game, and there's been a ton of Arcadia Quest stuff, so I'm not surprised that it didn't bring in that much. Starcadia Quest – On the flip side, I didn't back this game because of that exact same reason: I have sooo much Arcadia Quest stuff now that I haven't fully played, so why would I get invested in a new game line? Honestly, it seems like a mis-step to me to have this so close to the AQ: Riders campaign. I might have put some months in between these two campaigns but I think we are seeing burnout of the Arcadia Quest line. Considering Starcadia didn't even crack a million dollars, I'm not sure if CMON should invest in any future expansions. Maybe let this one simmer for a while, unless there is a wave of hype upon the game being released? Project: ELITE – Prior to this article, the only thing I remembered about this kickstarter is that Tom Vasel loved the game. Back when it came out previously, none of the reviews sold it to me, and again the art style just didn't appeal to me and say "Ooooo back me!!". Maybe I just don't like dark style SciFi/Alien style board games? HATE – HAHAHAHAHAHAHAHAHAHAHA. There's so much I could say about this kickstarter. The best thing about this kickstarter was the video and how absurd it was. And yet, what was even better about the video was this reddit thread (Warning: VERY NSFW) talking about other board games using the style of the HATE video. I mean, I like horror (more on that in a sec), survival, and mature games, but dismembering and torturing people is a bit much even for me. Cthulhu: Death May Die – Of all the kickstarters I didn't back from CMON, this is the only one I seriously considered for a long time. Also, just about anyone who knows my gaming preferences would assume that I did back this, as it checks a lot of my boxes: CMON game with beautiful miniatures, Eric Lang designed, Cthulhu themed, DICE! Why wouldn't I back it? Arkham Horror the Card Game is on my Top 10 games of all time! Honestly, the only reason I even considered the game is the beautiful miniatures. The base game by itself was $100, and looking over the game, I didn't see what CMON was bringing to the table that I didn't already have in the tons of FFG Cthulhu games I already had. And paying $100 when I know I'd really need to pay $250+ for the full experience? Not to mention, this was just before Gen Con and I was saving the pennies for that trip. At the time, and I still feel this way, I felt as if this was a game I need to play for myself before dropping some serious cash on. So if we take the (BIG) assumption that a majority of CMON fans are like me, this year featured: a game with a ridiculously mature theme that turned most people away, 2 games set in a dark scifi universe (one of which being *another* Zombicide game, the other being a reprint of a game that already *had* a kickstarter), a preorder for a small Arcadia Quest set along with a derivative style game, and a Cthulhu game that didn't really justify the high price tag (except for the oversized/outlandish statue). All in all, this year seemed to be a year of CMON entertaining a bunch of small niche segments of the gaming industry that probably hit a lot of the same people, instead of hitting a bunch of diverse people and niches. 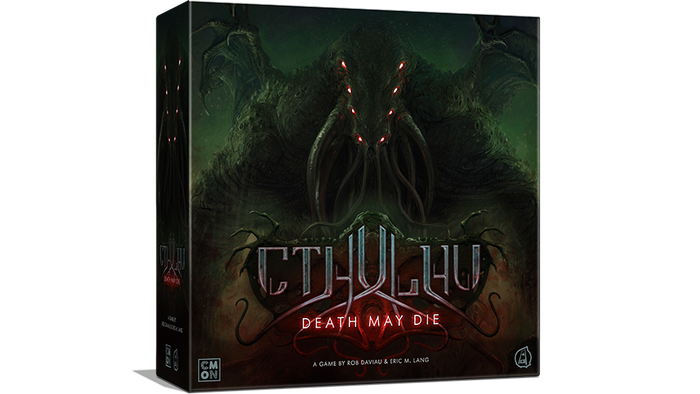 Honestly, if Cthulhu: Death May Die had been done during the spring, or maybe if they had a version to try at the CMON Expo, chances are I probably would have backed it. In summary: the sky isn't falling. Board games aren't dying, and I think instead of saying CMON "lost" money this year, I think a better way of thinking about it is that they "left" a lot of money on the table by making some weird kickstarter choices this year.